The traditional time of annual remembrance follows in the wake of All Souls’ Day each year, and also at that time of year when, before the start of a new Church year in Advent, our Sunday worship is directed to reflection on the things of the Kingdom of God. This year, 2014, marks the centenary of the outbreak of the First World War and acts of remembrance throughout Cork, Cloyne and Ross took on a particular significance. None more so in St Fin Barre’s Cathedral, Cork where, on Friday evening, 7th November, the Cork Branch of the Western Front Association hosted their annual Evening of Remembrance (in music, song and story) in the Cathedral for the first time. On Saturday, 8th November, the Bishop of Cork, the Right Reverend Dr Paul Colton, and the Dean of Cork, the Very Reverend Nigel Dunne, were present in the Cathedral all day to meet with Cork people (long-standing Cork families and people new to Cork) who have relatives who fought or who died in the First World War: people of all nationalities, any religious outlook and of whatever side in the war. Douglas Walsh (left) shows Dean Nigel Dunne (centre) a spoon used in the First World War by Sapper William Walsh of the Royal Engineers and which is used every day still at home by Audrey Walsh (right). Listening to their stories, handed down through the generations, looking at photos and artefacts (including medals, war equipment, a spoon, a first aid kit, paperwork, and a pieced of barbed wire from a battlefield on which 400 Munster people died), scanning photos and noting details. 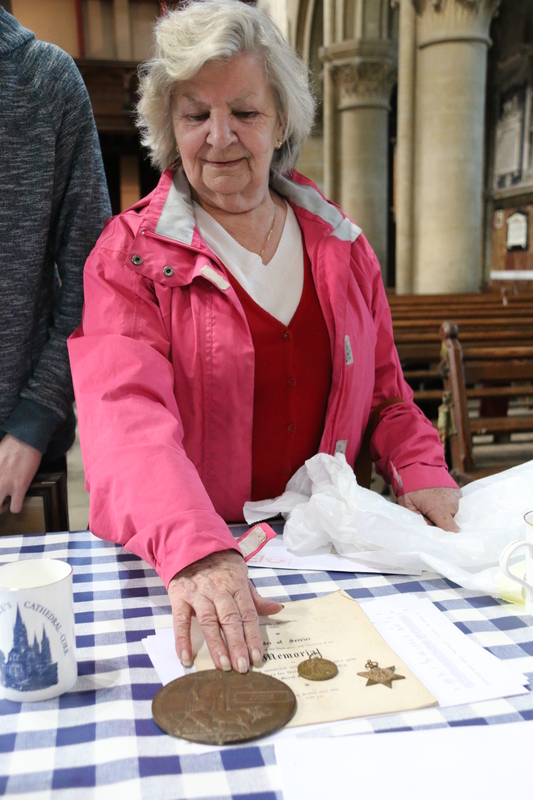 These photos – the Bishop and Dean’s ‘Putting Faces to the Names’ project – will be included on a new visual memorial at St Fin Barre’s Cathedral, Cork. The idea was suggested to the Bishop and the Dean by Cork-based historian, Dr Alicia St Leger. History students from Midleton College, Bandon Grammar School and Ashton School were present throughout Saturday to support as guides and to do all the paperwork, noting the details of veterans and of those who died. On Saturday evening, the Bishop compiled the list of those names garnered, amounting to 504 people. 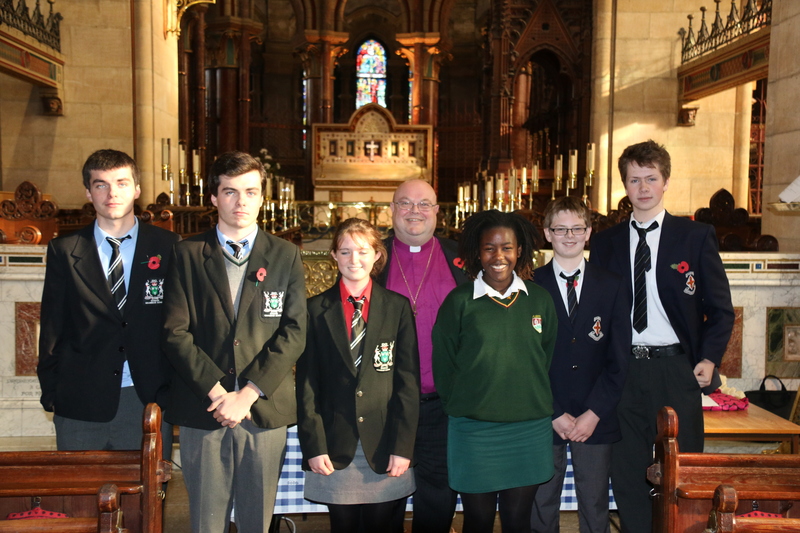 Senior History students from Bandon Grammar School, Ashton School and Midleton College with Bishop Paul Colton (centre) who assisted the Bishop and the Dean with the ‘Photos/Faces on Names’ Memorial project at the Cathedral on Saturday 8th November. l-r Conor Rowlands, David Rowlands, Helen Moriarty, Sarah Jere, Adam Ford and Luke Pierce. All of these were named out loud in a moving ceremony on Sunday morning, 9th November in St Fin Barre’s when a Requiem was celebrated (with Requiem by Gabriel Fauré being sung by the Cathedral Choir as the setting of the liturgy). On Sunday afternoon, Choral Evensong included a full Act of Remembrance when wreathes were laid at the Column of Heroes by representatives of the Defence Forces, the Royal Munster Fusiliers and the Cork Branch of the Western Front Association. 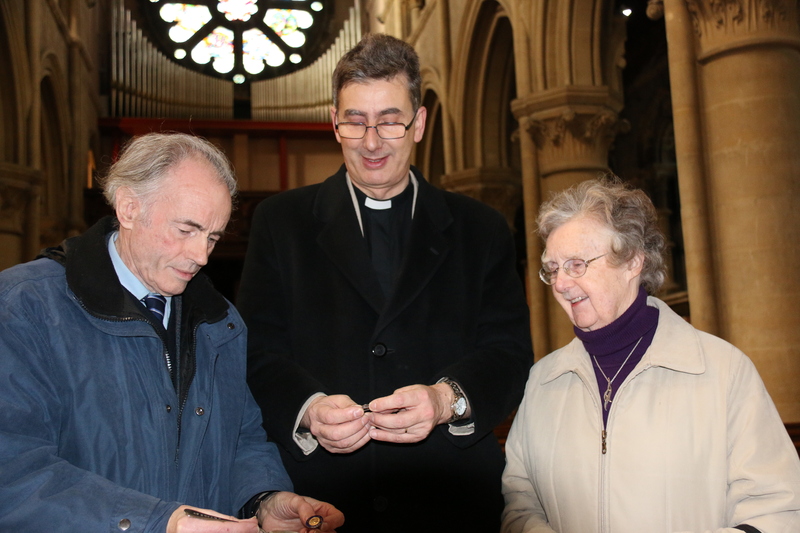 Theresa Walsh shows the Bishop and Dean ‘a death penny’ and other memorabilia of her ancestor Lt Thomas Coveney from Cork, a member of the Royal Irish Regiment, who was killed-in-action on 28th April, 1918. Thank you so much for doing this. My grandfather has never been publicly recognised in Ireland in a way like this before. 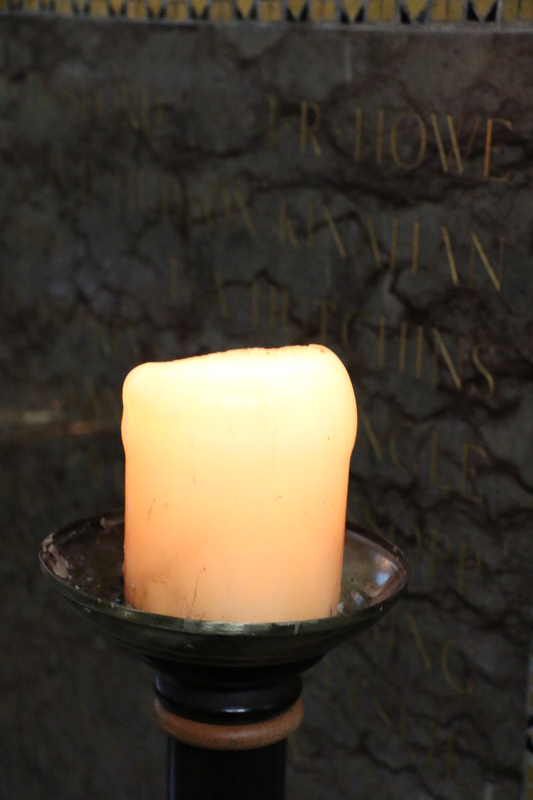 A candle burns at the Cathedral Memorial – The Column of Heroes. This entry was posted in Cathedral, Church Services, Contemporary Issues, Decade of Centenaries, Diocese. Bookmark the permalink.